The secret’s out: I had a strong hunch I might find something interesting to read about Greece when I walked into the magazine department at my local bookstore yesterday. 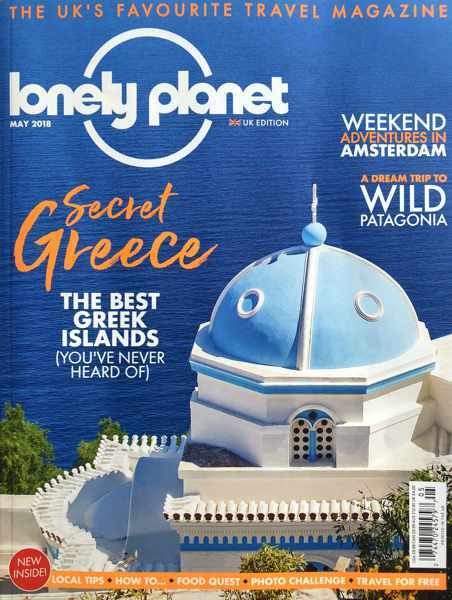 When I turned into the travel section, my premonition instantly proved accurate — standing at eye level on the front shelf was the latest edition of Lonely Planet, its cover graced with a photo of a blue-roofed Greek Orthodox church illustrating its “Secret Greece” feature story. In another pleasant delight, I realized I had seen that very same church in person — on Astypalea, during our island hopping holiday in 2009. 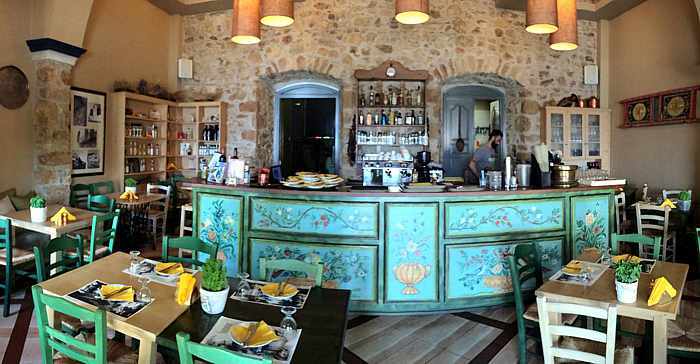 Astypalea is one of seven islands featured in Lonely Planet’s May issue and, in another curious coincidence, the article about it recommends staying in the very accommodations where we spent several nights: Fildisi Boutique Hotel. The main focus of the magazine’s Great Escape cover feature is the Northeast Aegean group of Greek islands; specifically, Lesvos, Chios and Ikaria. 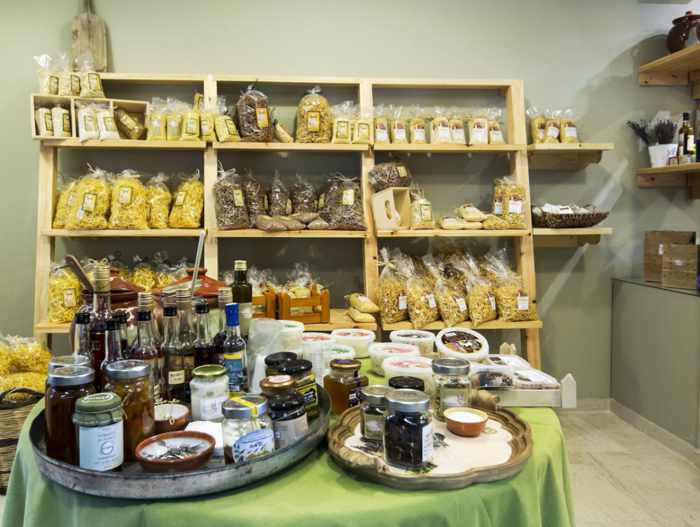 Stepping ashore on these particular isles “introduces olive farmers and wild honey, hidden villages and untouched beaches, and perhaps the secret to long life,” the feature story introduction says. 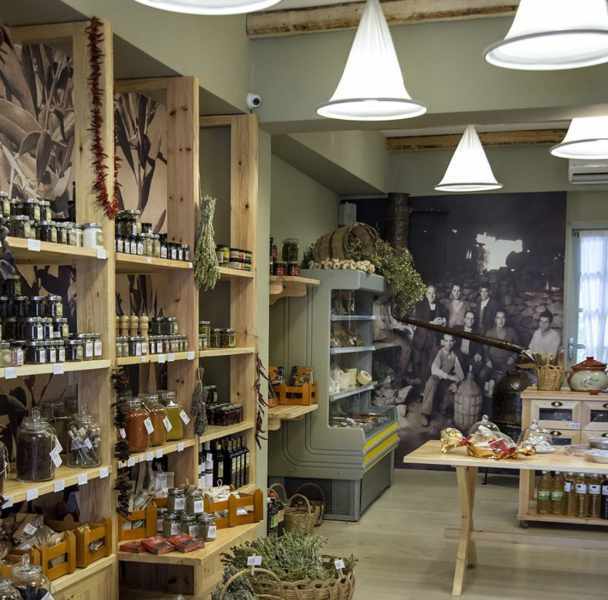 The second feature story invites readers to “discover a centuries-old tradition of mastic cultivation and the fortress-like villages that grew rich from it” in southern Chios. See if you can find a copy of the magazine at your local newsstand before it sells out. 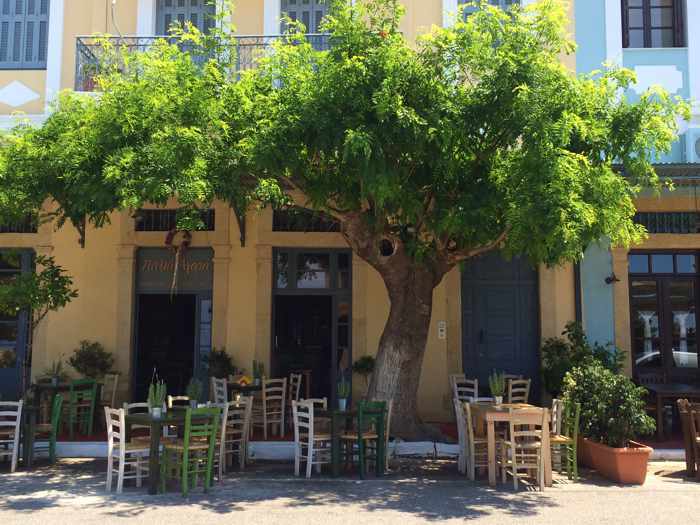 Great food & accommodations: We ate well and slept well during our brief 2-night stay in the small seaside town of Marathopoli last spring. Our only disappointment? Not having more time to enjoy our lovely hotel room longer, or to try other restaurants besides the two where we had delicious dinners. 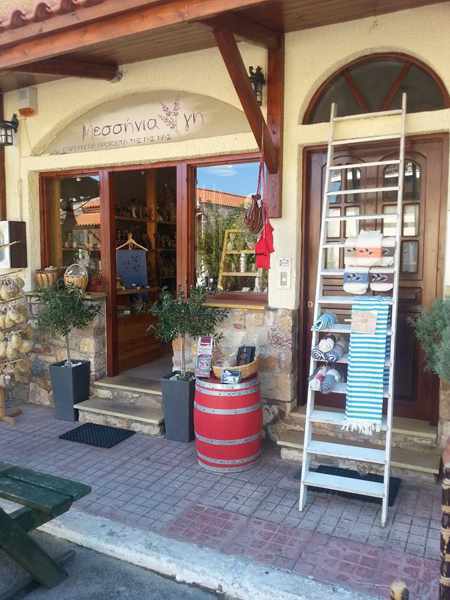 As I mentioned in my March 20 2018 post describing Marathopoli, we had chosen to base ourselves in the town so we could easily access top sites and attractions in Messenia during our road trip through the region. 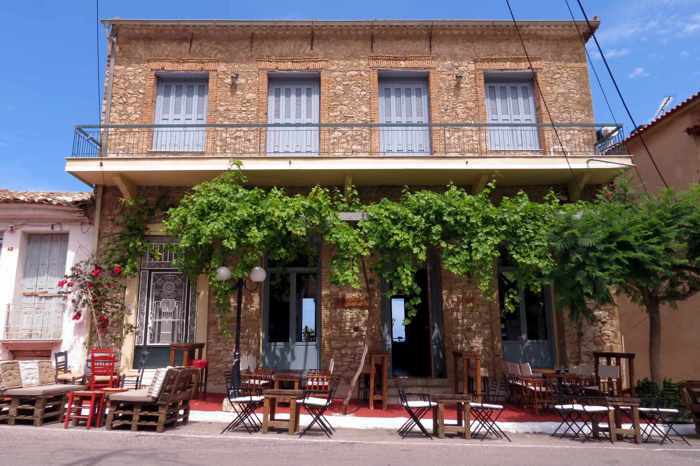 ♦ Messinian Horizons, a complex of 5 luxury maisonette villas situated about 3 km south of Marathopoli. For a late dinner on our first night in town, we went to Panorama Fish Tavern on the restaurant and bar strip that residents call The Sidewalk. Every dish we ordered — the calamari, horta, grilled local cheese, and meatballs — was tasty and enjoyable, while the service was very good. 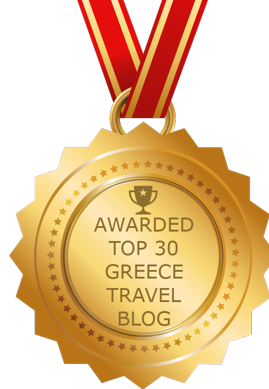 The next night we chose Artoinos Mezedopolio, which had received great reviews on travel websites and restaurant apps. Our selections there included skordalia, gigantes, chick pea balls, spetzofai sausages, fried pork in white wine, and pleuvrotos mushrooms. We loved everything and would be hard-pressed to list a favourite, but all of us agreed that the sausages and mushrooms were stand-out dishes. The wine and service were excellent to match. 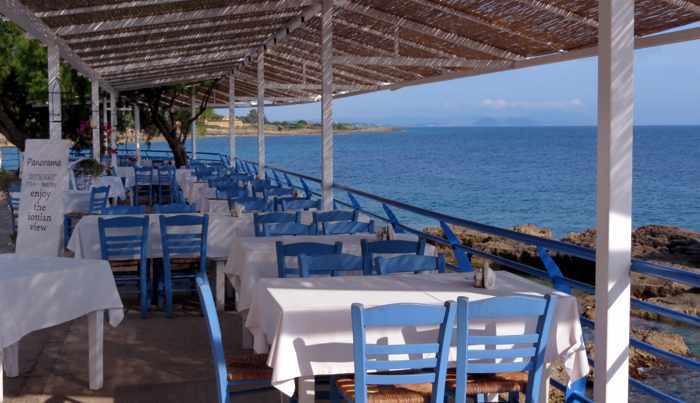 Artoinos would probably be the first place we’d go for dinner next time we return to Marathopoli. If we had stayed out late for a night on the town, though, we certainly would have enjoyed coming back to the Artina Nuovo to crash in our super-comfy beds and awake to the calming panoramic views of the harbour and sea. More photos of our room and its views, plus pictures of the hotel, can be viewed on page 2 of this post. 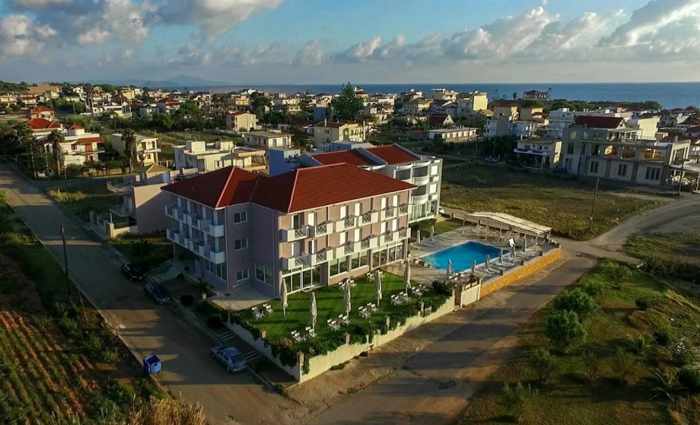 Of course, more photos and information about the Artina Nuovo, and its sister Artina Hotel, as well as online booking, can be found on the official hotel website. 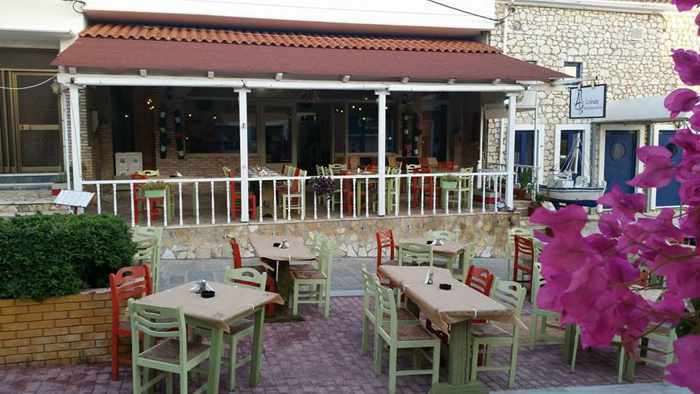 For customer reviews of the various places to eat in the town, check the Marathopoli restaurant listing on TripAdvisor. 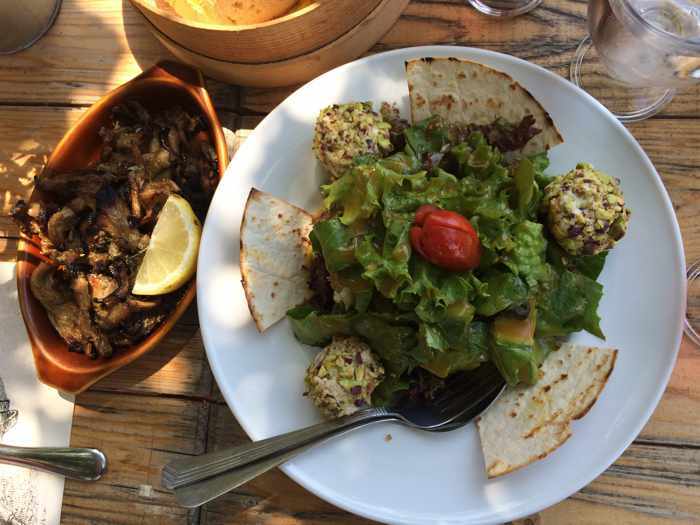 Late lunch: We felt famished after our hike to the Old Castle of Navarino and a long walk during our visit to Voidokilia beach, and all of us agreed that a hearty lunch of traditional Greek cuisine would really hit the spot. 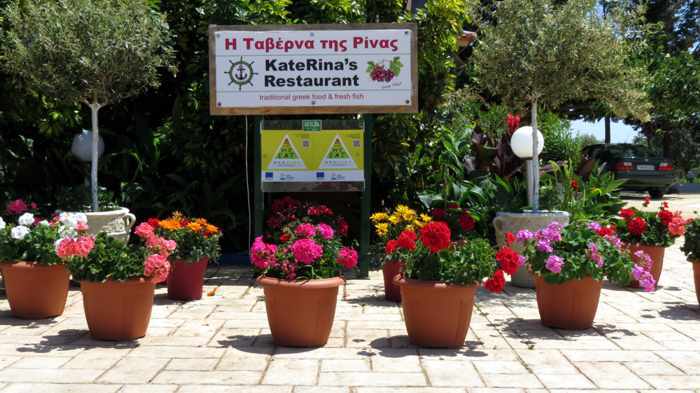 KateRina’s Restaurant near Romanos had been recommended by several reliable sources, and was only a 10-minute drive away, so we piled into the car and headed right over. We arrived shortly before 3 in the afternoon, so the lunch crowd had moved on and the few customers still in the taverna were all close to finishing their meals. Restaurant proprietor Katerina greeted us with a warm welcome and showed us to a table at the edge of the veranda where a light breeze — plus beer, wine and water — helped us cool off after our half day in the hot sun. 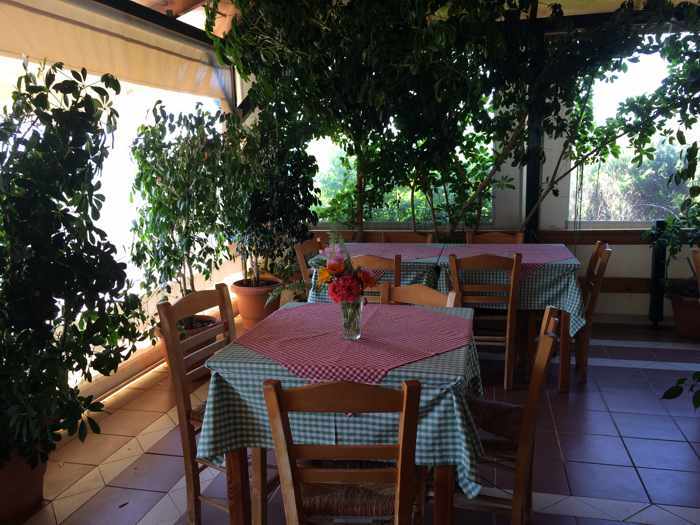 Given our ravenous appetites, we weren’t sure how much food to order, but KateRina assured us that our selection of Greek salad, tzatziki, zucchini balls, meat balls and a local pork dish would be probably be just the right amount for four hungry people. So we sat back to relax and enjoy our beverages while KateRina and her kitchen staff prepared our lunch. 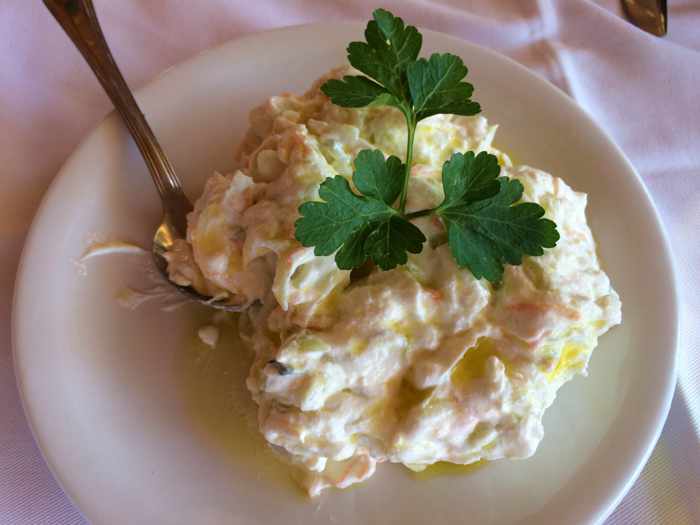 The taverna was celebrating its milestone 50th anniversary in 2017, and once we tasted Katerina’s traditional cuisine we immediately understood why her restaurant has been highly recommended for so long: the food was superb. The zucchini balls — a house specialty which has long been a customer favourite — were delicious, as were the pork (served in a yummy tomato sauce) and the tender, juicy meat balls (accompanied by a heaping side of scrumptious fried potatoes). 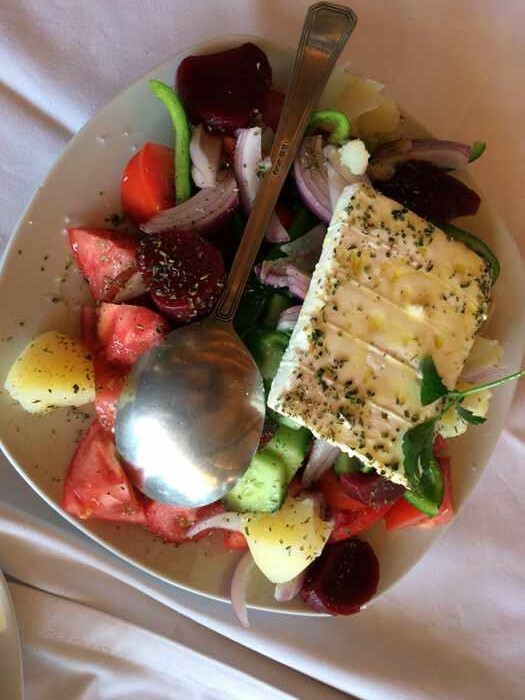 We also loved the large horiatiki , which included two ingredients we’d never seen before in a Greek salad: cooked beets and potatoes. (They added nice flavours and textures to the dish.) Then there was the restaurant’s signature tzatziki, served with a platter of grilled bread. It was simply outstanding. Tzatziki has never been one of my favourite starters, but KateRina’s version was almost to die for. The service was excellent and Katerina was a delightful hostess. At the end of our meal, she took time to join us for some conversation about her taverna and the local area before returning to the kitchen to prepare for a very busy night — a group from a nearby resort had booked the entire restaurant for dinner. 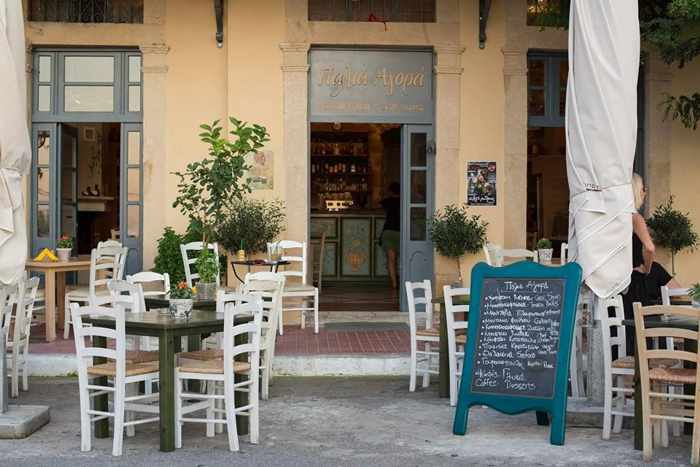 If you’re travelling in the southwestern Peloponnese, plan to stop by KateRina’s for a lunch or dinner of fabulous Greek cuisine or delicious fresh fish. 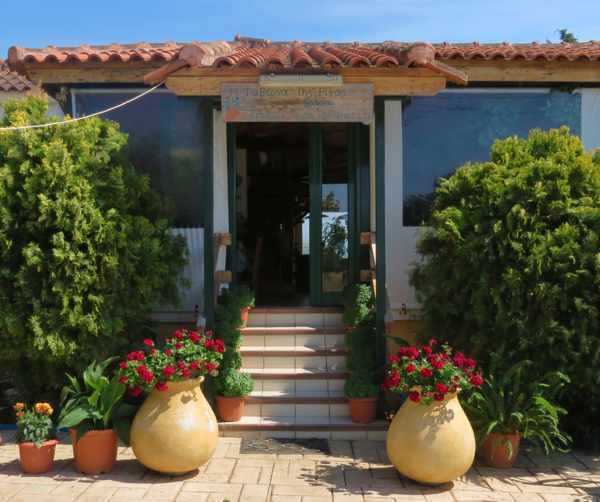 It might be wise to make a reservation, though, since the restaurant is quite popular with tourists visiting the nearby town of Pylos or Voidokilia and other close-by beaches. 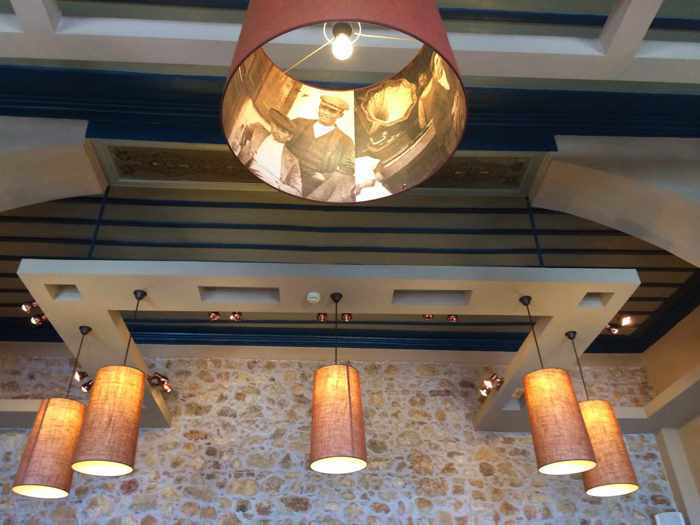 Large groups from the five-star Westin Costa Navarino and Romanos Luxury Collection Resort often bus over to the taverna, as well, so the place can get very busy or even completely booked out. Contact information and hours of operation are indicated on the KateRina’s Tavern website. 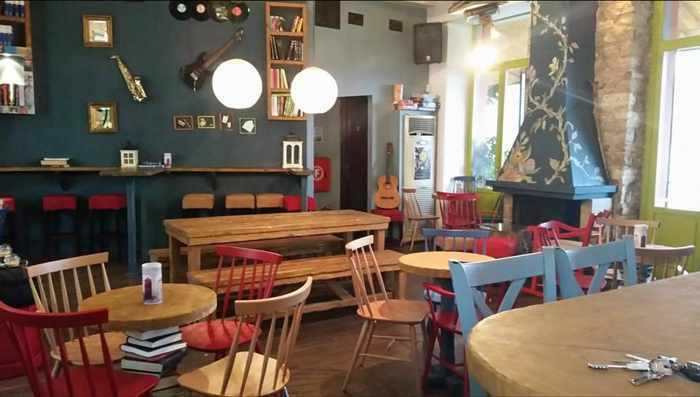 If you want to read what other people have said about the restaurant, check the Katerina’sTavern listing on TripAdvisor, where more than 250 customers have posted reviews. A red marker pinpoints the location of KateRina’s Restaurant on this Google image of the Navarino Bay area of the Peloponnese. 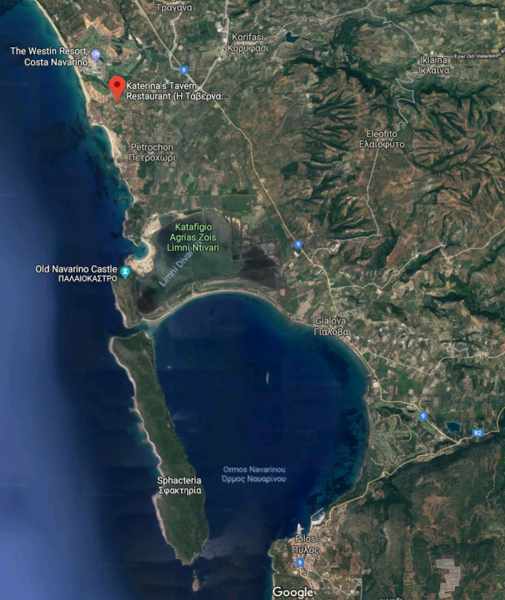 The taverna is very close to the Westin Costa Navarino Resort (top left) and is a short drive from the town of Pylos (bottom center).